. : Optics & Photonics Focus :: Quantum Circuits: Fast and Cool :. How can we be sure about anything in nature? Without experiments, all physics is merely speculation. Optical clocks now allow us to test science with unprecedented accuracy, refining our understanding of the universe. In the 20th century information technologies based on microelectronics changed the world. In the 21st century nanophotonics looks very likely to become a key factor in the building of quantum information technologies. Mechanical automated feedback. 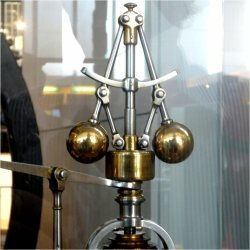 James Watt’s famous centrifugal governor illustrates the use of an intrinsic classical feedback mechanism to stabilize a system. The heavy balls at the end of the levers are driven away from the rotational axe as the rotational speed increases. This increases the rotational energy of this device, and stabilizes the angular speed of the machine, which drives the centrifugal governor. Picture: Mirko Junge, Science Museum London. What is the technological backbone of future information devices? Information technologies based on microelectronics, such as mobile communications, computers and the Internet, have truly revolutionized the way people communicate, conduct business, and do science. After several decades of intense technological progress, microelectronics appears to be reaching its fundamental physical limits: soon, there will be a call for new technological approaches. Researchers led by Hideo Mabuchi at Stanford University (California, USA) have, recently, theoretically shown that nanophotonic circuits are capable of autonomously managing not only classical information but also quantum information: their proposed all-optical circuit could well manage quantum information without the need for electronic control circuits, thus paving the way for the quantum computers of the future. In the past century, microelectronics and information technology shifted the technological focus from mechanical engineering to electrical engineering. Microelectronics, in particular, has been a very powerful tool for managing classical information encoded in binary digits, or bits. The manipulation of these bits enables the executing of programs and also the generating, saving and reproducing of data. At the circuit level, all electronics is reduced to the combination of a few basic electronic components, such as transistors, resistors, and capacitors. In 1965, Gordon E. Moore  observed that the number of transistors on a chip, and thus the chip’s performance, doubles every 18 months to two years. His observation remains unchallenged today, some 45 years later. After decades of optimization, however, the limits of the miniaturization of microelectronics are becoming increasingly apparent. "Microelectronics has some critical limiting aspects to it," Mabuchi explains. "One problem with ever smaller electric conductors in microchips is that a conductor’s resistance increases as its cross section decreases. Therefore, today’s tiny microchips present great challenges associated with energy density and heat dissipation. Another problem with conventional microelectronics is that it cannot handle quantum information because microchips are so energetically lossy. As we believe that the emerging principles of quantum information science will someday lead to technological breakthroughs, our challenge today is to develop a robust alternative paradigm for implementing complex circuits that can operate in the quantum coherent regime." Photonic circuit with embedded control. The nanophotonic circuit proposed by Kerckhoff and coworkers stores one logical qubit in three physical qubits (shown in yellow), which can, for example, be stored in nanooptical cavities. The state of any one physical qubit is continuously compared to the other two (shown in the blue beam lines) and automatically corrected as soon as it is different (shown in the red beam lines, which are controlled via dedicated cavities, here shown in green). Picture: Joseph Kerckhoff/MabuchiLab. Researchers have been considering, for quite some time, different types of systems that can store, manipulate and transport quantum information. The quantum information theory extends the classical information theory in order to include not only bits with values of 0 or 1, but also quantum bits (qubits), which can simultaneously take the values of 0 and 1. This allows for the study of new classes of algorithms and gives new insights into quantum mechanics. Moreover, many researchers believe that the use of qubits, instead of bits, is likely to lead to new computational devices that are better suited to simulating highly complex problems from science and engineering. The new idea put forward by Mabuchi’s group is to consider integrated quantum circuits that include feedback mechanisms to maintain quantum information. "Historically," Joseph Kerckhoff from Mabuchi’s group points out, "feedback mechanisms have played a key role in engineering. James Watt, for example, invented the centrifugal governor that succeeded in stabilizing the angular speed of a machine by using two rotating masses. In more recent times, information technology devices have relied on electronic feedback mechanisms. 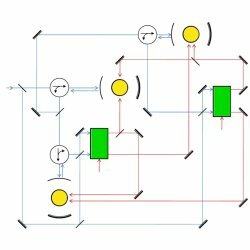 However, in this case, there is an underlying problem for quantum information technology: there is an inherent technological mismatch between a quantum mechanical system and the classical system (e.g., an electronic feedback mechanism) that manages the former. Our research shows, at least in principle, that it is possible to build nanophotonic quantum circuits that do not need any external controls. In this way, our circuit uses a quantum mechanical system to manage a quantum mechanical device." To illustrate this new idea, Kerckhoff proposes a quantum circuit — composed of nanophotonic elements — that can store quantum information. The elaborate arrangement of these elements continuously probes for certain classes of errors in the system and autonomously corrects them as they arise. There are still a number of technological challenges to be solved before we can use nanophotonic circuits in engineering. For example, as both Kerckhoff and Mabuchi point out, the production of the required quantum nanocavities, and their subsequent combination into a nanophotonic circuit, both remain extremely challenging. However, none of these difficulties challenge fundamentally the future use of nanophotonic circuits with embedded control. "With more autonomous photonic circuits," Mabuchi says, "it looks very likely that engineers will be able to build new, more powerful devices — for classical information or, in the longer run, for quantum information." "In the beginning, we wanted to see how we could use a nanophotonic circuit that could do something useful autonomously," Kerckhoff concludes, "and now we are beginning to see a whole new category of integrated circuits." Gordon E. Moore, Cramming more components onto integrated circuits, Electronics Magazine, 19 April 1965. Joseph Kerckhoff, Hendra I. Nurdin, Dmitri S. Pavlichin & Hideo Mabuchi, Designing Quantum Memories with Embedded Control: Photonic Circuits for Autonomous Quantum Error Correction, Physical Review Letters (2010) 105, 040502 (link).